Senior African policymakers told an international forum at Harvard University last week that without inclusive growth, Africa's economic trajectory will be wide off the mark of real development. 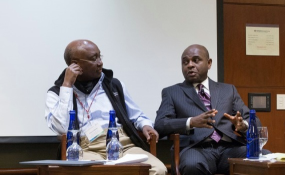 Donald Kaberuka, former President of the African Development Bank (AfDB) and former Minister of Finance of Rwanda, who is now the Hauser Leadership Fellow at Harvard University's Kennedy School of Government, and Kingsley Chiedu Moghalu, former Deputy Governor of the Central Bank of Nigeria and now Professor of Practice in International Business and Public Policy at Tufts University's Fletcher School of Law and Diplomacy, both spoke on a panel at the 2016 Global Empowerment Meeting (GEM) at Harvard University's Center for International Development on April 14. Kaberuka emphasized that inclusion of every citizen and every group in the political process and the exercise of political power is essential to attaining inclusive economic growth. "The political process is the foundational path to inclusive growth", Kaberuka stressed, adding that the practice of excluding groups from political empowerment and governance, which is common in Africa, has militated against broad-based transformation in the continent. Moghalu mapped a path to inclusive growth: "In order to achieve inclusive growth, we should be clear about what it means and what it doesn't" he told the GEM, a high-level international conference at which senior policymakers and global thought leaders tackle problems of poverty and economic development. "Inclusive growth is about bringing all sectors of the economy and different strata of the society into a process of broad-based economic growth. This raises incomes and creates wealth across the board through increased labor productivity. It is not the same thing as inequality. That is a wider problem created by the unequal distribution of capitalist wealth and is being addressed in some industrially advanced countries with income and wealth redistribution through taxation adjustments and other means", the former CBN chief said. The former central banker observed that "inclusive growth also is not quite the same thing as social protection, although there is some relationship between the two. Inclusive growth focuses on the productivity of labour across a balanced set of sectors, and on ensuring employment, while social protection and welfare may include exhaustive fiscal transfers that do not necessarily create any goods and services". He suggested that achieving inclusive growth in Nigeria and other developing countries required an approach focused on (a) conceptual clarity, which is necessary because a proper understanding of what inclusive growth is and what it is not will help policymakers avoid the wrong kinds of "solutions" that will in reality not solve the problem; (b) rural based economic growth as opposed to "urban bias" in development thinking; (c) the fundamental role of business in promoting inclusive growth; (d) infrastructure, which promotes equality of opportunity to access the marketplace of labour and goods; (e) the creation of an effective social contract between the state and its citizens, which is presently absent; (f) financial inclusion; and (g) effective political leadership that can translate political power, authority and responsibility into inclusive growth-related public policy, with concrete outcomes that bridge the gap between expectations and performance. Moghalu noted that the failure to consciously pursue inclusive growth in has resulted in many African countries achieving high GDP growth rates but retaining high rates of poverty and ranking low on the United Nations Development Program's Human Development Index, which measures quality of life and standard of living. Kaberuka said that Africa has witnessed strong improvements in the continent's economies over the past decade, and that this was not, as conventional wisdom holds, only due to the commodity boom. But he accepted that GDP growth alone is not enough, recalling a cab driver in a francophone African capital who, on his client suggesting that the country's economy was booming, quipped: "nous ne pouvens pas manger GDP!" ("we can't eat GDP!"). Other top economists who spoke at the conference included Dr. Luis Cespedes Cifuentes, Minister of Economy of Chile, Dr. Luis Videgaray, Minister of Finance of Mexico, Dr. Douglas Elmendorf, Dean of Harvard University's Kennedy School of Government, Ricardo Hausmann, Professor of the Practice of Economic Development and Director of the Centre for International Development at Harvard University, and Yuwa Hedrick-Wong, Chief Economist of the Mastercard Center for Inclusive Growth..